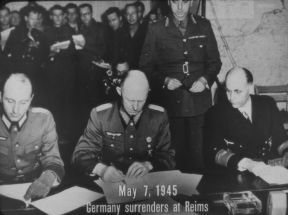 France, the war in Europe ends when Colonel General Gustav JodI, Chief of Staff of the German Army signs the Unconditional Surreader agreement marking the final capitulation of the Nazi State. 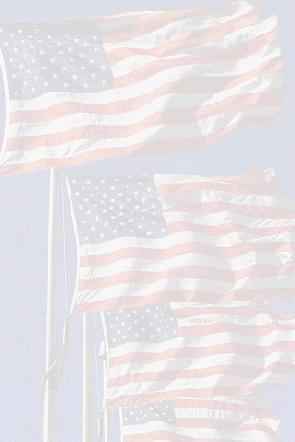 Victory in Europe now targets the full force of American military might to a single enemy. 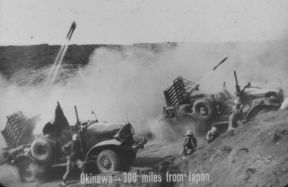 The Japanese Island of Okinawo only 300 miles from Japan, is invaded by the American Army and Marine Corps, here seen with mobile rocket launchers. Three months of bitter and costly fighting is required to conquer the island. 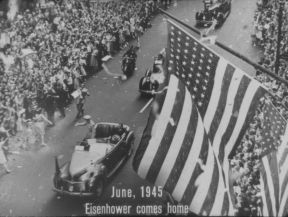 New York City gives a tremendous welcome to General Dwight D. Eisenhower, Supreme Allied Commander, who returns to America after receiving high honors from Russia, Britain and France for his great achievements and contributions to Victory Over Germany. 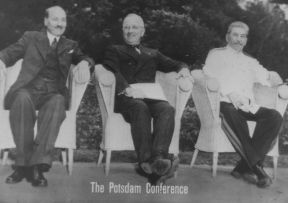 The new Big Three Prime Minister Atlee of Great Britain, President Harry Truman and Generalisimo Joseph Stalin of Russia meet in Potedom, Germany in July, 1945. The President, in the name of Allied nations warring on Japan, issues an ultimatum demanding unconditional surrender, else total destruction from the skies. The world is startled by the news that atomic energy. 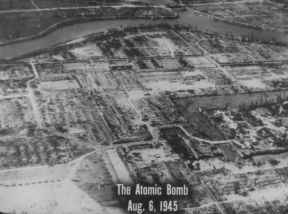 harnessed by scientists in the United States, has been released in a single bomb over Hiroshima, Japan, which wipes out nearly the entire city. On board the U. S. S. Missouri. 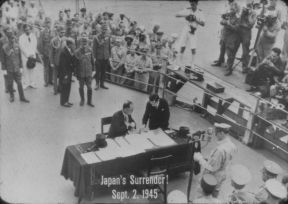 Japanese Foreign Minister Mamoru Shigemitsu signs the document of unconditional surrender on behalf of Emperor Hirohito as Army and Navy commanders of all the United Nations witness the ceremony. Thus ends almost four years of the costliest but most brilliantly conducted war in American history.